Here’s a picture of a frame in my Marchetti frame fixture. 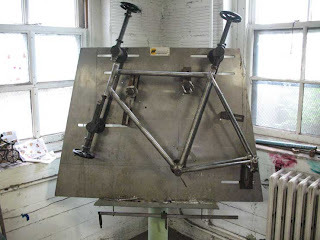 The front triangle is brazed and has been put back into the fixture to tack on the rear triangle. I don’t have the head tube held in place because it’s not necessary when tacking on the rear. This is a close up of the seat stay as it rests on the seat lug before tacking. You can see that the seat stay is capped and not plugged. 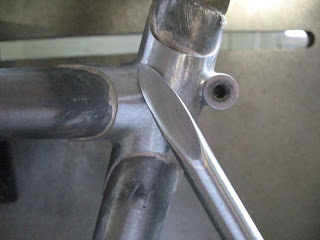 The difference is with a plug a pre-shaped piece (either turned or cast) is brazed onto the end of the seat stay. A seat stay cap is when a piece of tubing is brazed onto the end of the seat stay. In this case it’s a scrap piece of chain stay to create a concave finish. You can see the tip of the cap wraps slightly around the seat lug. It increases the surface area thereby increasing the strength of the braze. That’s cool but not necessary. Mostly I do it because I like the way it looks. I’ve never liked a full wrap like the old English bike builders did. I also don’t like when the stay is just stuck on the side of the lug sitting out there in space. To my eye, this semi-wrap splits the difference aesthetically. The seat lug has been filed and thinned. After I’ve brazed the whole frame then I will sandblast around the joints. That will quickly remove any of the silver flashing which is the excess silver that you can see around the lug. The top of the seat lug will also get shaped then. Currently the seat tube extends through the lug and is left there until I’m done brazing. Then I’ll greatly reduce it’s length and change it’s profile. Pictures of that later.